Arguably, Francois Boucher was one of the greatest artists in the rococo style prevalent under the monarchy of Louis XV. Inspired by the 18th century landscape artist, Jean-Antoine Watteau, Boucher’s idyllic depictions of mythological and pastoral art are much prized by museums and collectors. Being King Louis’ court painter, Boucher’s tapestries often portrayed scenes of French royal life. 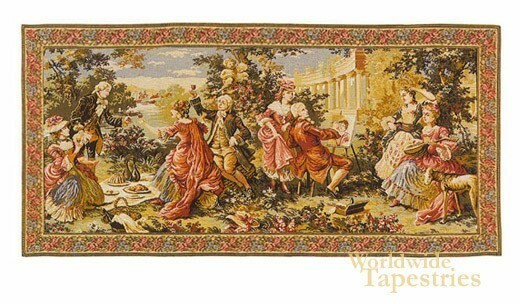 Such is the case with this fine tapestry, which depicts the lavish lives of the upper class royals as they enjoy a summer picnic in a wooded opening in a park. The fine detailing, skilful use of color and engaging composition is classic Boucher. “Royalty in the Park” is lined on the back and has a tunnel for easy hanging. Dimensions: W 65" x H 32"